What is SKU, SKU Rationalization and SKU Optimization? Supply Chain Opz: What is SKU, SKU Rationalization and SKU Optimization? What is SKU, SKU Rationalization and SKU Optimization? How can you reduce costs and complexities of your supply chain? 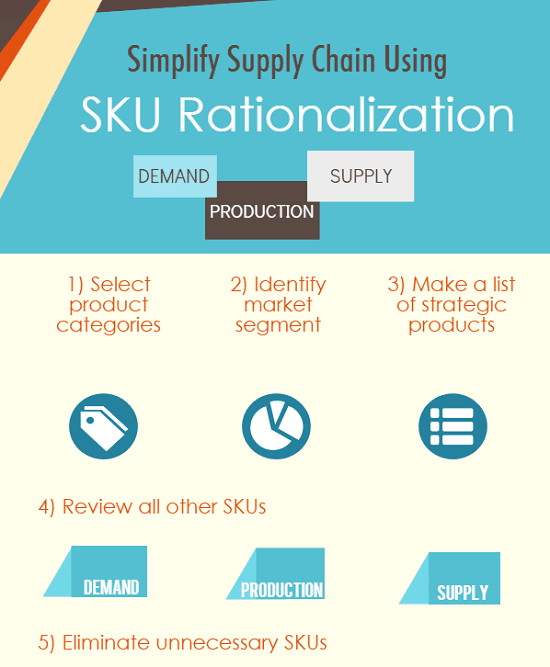 What is the difference between SKU Optimization, Product Realization, and SKU Rationalization? "SKU stands for Stock Keeping Unit. It is the identification of a product or service using alphanumeric code. Each product will have its own SKU code so customers can tell the difference. For example, one product with 3 different labels should have 3 different SKU codes. Then, SKU code is used to track how many product variants the company has." In a traditional business sense, it is always good to have many products for customers to choose from. However, having too much stock keeping units (SKUs) can become a complex business operation. Because, too many products will lead to too many suppliers, too many data to collect and analyze, too many people to control, too many machines used to make products and too much storage space required. "SKU Rationalization, also known as SKU Optimization or Product Rationalization, is the decision-making process to determine if a particular product should be kept or discontinued. So the company can reduce inventory costs and cut down on complexities in procurement, production and distribution processes." SKU rationalization project is not the job of inventory control people alone and a cross-functional team is required. Establishing a clear project boundary is the key to success. At this stage, you pick which product family or category or brand you would like to review. Sometimes one product category may serve many customers. Then it may be necessary to know which market segment or sales channel we are focusing on. So project scope can be narrowed down further. At this stage, we try to identify SKUs that we would like to keep. Then, you need to collect data on each SKU such as demand, profitability and common pack sizes. Do you need to know these demand/production/supply characteristics? Consider an item with an average sales volume with long lead-time and demand fluctuation. Do you really want to keep this item? When you know all aspects of each item, it's easier for a team to make the objective decision whether to keep the items or eliminate some of them. The final step is to trace SKUs you want to eliminate back to their raw materials, WIP, and all related finished goods. As you can see, when you do this kind of project properly, you can reduce the numbers of suppliers you have to deal with, unnecessary machine setup time, unnecessary storage requirements. You can also free up your manpower so they can focus on some other things more productive. - Hilliard, D. D. J. (2012). Achieving and sustaining an optimal product portfolio in the healthcare industry through SKU rationalization, complexity costing, and dashboards (Doctoral dissertation, Massachusetts Institute of Technology). - Leiter, K. M. (2011). Assessing and reducing product portfolio complexity in the pharmaceutical industry (Doctoral dissertation, Massachusetts Institute of Technology). - Lew, M. (2010). Modeling supply chain benefits of efficient assortment (Doctoral dissertation, Massachusetts Institute of Technology). - Wilding, R. (1998). The supply chain complexity triangle: uncertainty generation in the supply chain. International Journal of Physical Distribution & Logistics Management, 28(8), 599-616.